“Today marks one year since President Obama came to Staten Island and toured the damage in New Dorp Beach. On that day, promises were made by our President, our Governor, and our Mayor. While the State’s housing recovery program seems to be in full swing, far less can be said about the City’s Build-it-Back Program. “On Staten Island, most homeowners have yet to see a dime of federal funding distributed through Build-it-Back, while some have yet to move back home. For the first time in their lives, they may be wishing they lived on Long Island. “There is no excuse for New York City’s mishandling of housing recovery. The people should be the #1 priority when it comes to recovery. Period. That is what I fought for in Congress and that was our intent in passing the Sandy relief bill. “With little indication that the City to do the right thing, I have called on Secretary Donovan to release an additional $600 million from HUD- specifically for non-NYCHA housing - to meet all the unmet housing needs - from Priority 1 to those awaiting reimbursements. I have also called on the City to completely overhaul its misaligned priorities and make housing recovery its top priority. “The working and middle class people of Staten Island deserve the assistance they were promised. They are at their wits’ end, and without additional action, they do not stand a chance. There will be urban blight as people begin walking away from mortgages or foreclose on their homes. Property values will decline. NYS has received about 4,500 applications. Through the State program, homeowners have already had their homes inspected and 4,295 have been issued award letters (as of October 23, 2013). Homeowners are eligible for up to $300,000 – with an additional $50,000 for mitigation. The average homeowner on Long Island will receive over $112,000 through the State’s program. Governor Cuomo has dedicated $800,000 to housing recovery. NYC has received about 24,000 applications. The first tranche of federal funding to NYC provided $1.77 billion in CDBG recovery funds, but the City chose to put only $648 million into housing – enough to meet only 1/3 of the Priority 1 housing needs (or assist only 4,000 of its 12,000 Priority 1 applicants). On November 12, 2013, Rep. Grimm sent a letter to Secretary Donovan requesting an additional $600 million specifically for non-NYCHA housing to meet all unmet housing needs. On November 13, 2013, Rep. Rep. Grimm sent a letter to Mayor Bloomberg asking that the City reprioritize its CDBG funding plan to better meet the recovery needs of homeowners by making them the #1 priority. 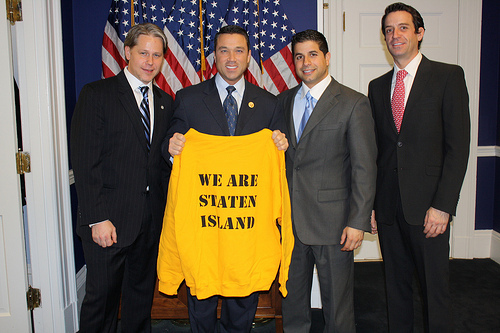 Good job Rep. Grimm! Keep writing to Mayor Bloomberg to reprioritize it’s CDBG funding plan to better meet the recovery needs of homeowners by making Staten Islander’s #1 priority.